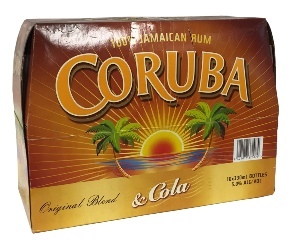 Coruba Jamaica Rum is a 100% Jamaican Rum made to the older planters rum style. Coruba & Cola is a convenient pre-mixed version of New Zealands leading brand of Rum. Have order these 3 times over the last few months reminds me of summer days at home! Order arrived along with £100 pounds of other goodies and the rum n cokes were cracked open on a warm summers night when we had a bbq! Loving your work Sanza!